It’sNational Lollypop Day! 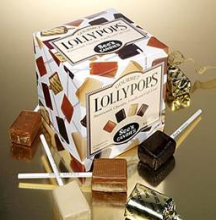 See’s Candies will be giving away a FREE lollypop to every customer who visits their stores today, July 20th. You’ll also be able to buy lollypops at a reduced price. There is also a coupon available on Facebook for $2 off any See’s purchase of $20 or more. See’s is the reason my teeth will all fall out one day! What’s your favorite flavor lollypop? Mine has always butterscotch but I’ve been wanting to try the root beer for some time! Butterscotch is mine too! When we visited in June i had to go by See’s just to get some, got some root beer also. Still haven’t tryed the root beer yet, maybe I’ll do that today. Thank Cam for reminding me, have a great day!